What if you could live life through a movie? The powerful Emulation Corp provides this unique service for Noah Wilson (Getty), but after being marked for death and the target of a nation-wide manhunt, Noah's life descends into a race for survival. Somewhere in-between reality and fiction lies the truth. 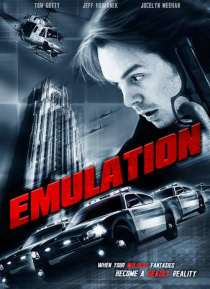 Emulation is a clever, explosive action-thriller with a maze of twists and turns that will keep… you guessing until the very end.